Conference "Euro, 7 years after"
We, at the Ithaka Foundation, are confident that our action will lead to a better understanding and better function within a United Europe. Through our programmes, we believe that in the next years we will inspire and contribute to the dialogue between the civil society of the EU member countries and candidate countries for EU membership” lagging behind”. The enlargement process offers the chance to heal forever the artificial division of Europe , and the Europeanization of the Balkans offers the chance to show how reconciliation and cooperation can be mutually reinforcing. Peace and prosperity lie at the heart of the benefits which enlargement will bring. Our on-going programmes: “EU Awareness”, “New Words for Europe ”, “The cycle of conferences aiming to disseminate information about EU”,” Branding Romania “and,” Our Europe”, are synergistically designed to promote an active dialogue with the EU and the transatlantic dialogue. We, at the Ithaka Foundation are confident that our action will lead to a better understanding and better function within a United Europe. Our on-going programmes: "EU Awareness", "New Words forEurope", "Social Corporate Responsibility", "Branding Romania" and, "Social Corporate Responsibility", are synergistically designed to promote an active dialogue with the EU and promote the transatlantic dialogue. First:Accompany what is today a fact, that Romania and Bulgaria will be able to continue their progress, as the doors of the EU will definitely not be closed after this year's historic enlargement. Second: Lay out a blue print to later cooperate with those countries in the region at varying stages in the SAA process, who will also continue to make progress with the perspective of eventual EU membership. Through our programmes, we believe that in the next five years we will inspire and contribute to the dialogue between the civil society in "the more advanced candidate countries" and the ones lagging behind. The enlargement process offers the chance to heal forever the artificial division of Europe, and the Europeanisation of the Balkans offers the chance to show how reconciliation and cooperation can be mutually reinforcing. Peace and prosperity lie at the heart of the benefits which enlargement will bring. The Ithaka Foundation proposes for 2005 an action plan in continuity with its achievements of 2003-2004 (conferences, trainings, publications...), elaborated upon consultation with its partners. 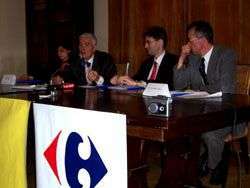 La Fondation Ithaka en parteneriat avec l�Institut Fran�ais de Bucarest a organisé le 2 juin 2005 un débat: �Le referendum sur la Constitution européenne, France, 29 mai, des explications et des conséquences�. Le débat des journalistes roumains et fran�ais a été modéré par M. Yves-Claude LLORCA, Directeur pour la Roumanie de l�Agence France Presse, et M. Luca NICULESCU, Redacteur en chef, Delta RFI. 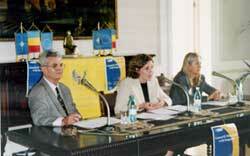 The Ithaka Foundation organized in Bucharest on the occasion of Europe�s Day (9th of May 2005) a colloquium �From Signing the Treaty to a Successful Integration in the United Europe�, an event organized in partnership with the Service of Cultural Activity and Co-operation (SCAC, French Embassy in Bucharest). 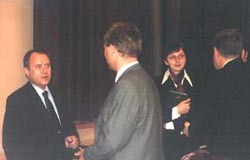 The participants (such as: H.E. Hervé Bolot- French Ambassador in Romania, Mr. Leonard Orban- Secretary of State in the Romanian Ministry of Integration and former Chief Negotiator for the EU, Mr. Yves Claude Llorca, director of France Press Agency in Romania) debated on current European events (the signing of the Accession Treaty of Romania to the EU, the referendum regarding the European Constitution). The formation program for Romanian young journalist regarding European affairs called Our Europe followed the conference. 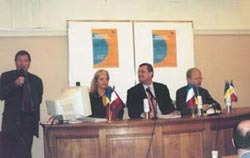 The Ithaka Foundation was one of the organizers of the conference The European Integration, countdown for Romania held in Cluj on the 21st of April 2005. The topic of the conference was: the allocation of European funds (ISPA, SAPARD, and PHARE), in what way and to what extent are these funds used at present? Our guests: Mr. Eugen Teodorovici- President of the Management Authority for the Cohesion Fund, Mr. Alexis Gressier- Task Manager ISPA, the Delegation of the European Commission and Mr. Gabriel Friptu- Director at the Romanian Ministry of European Integration. Mr. Luca Niculescu, Chief Editor at Delta RFI chaired this conference. The future of Europe: Which Romania in which Europe? The Ithaka Foundation has organized on March first at Romania's Foreign Ministry a conference « The future of Europe: Which Romania in which Europe? ». Our guests of honor were Mr. Pierre Moscovici, Vice-President of the EU Parliament, Romania's rapporteur at the EU Parliament, Mr. Mihai Razvan Ungureanu, Romania's Foreign Minister, Mr. Leonard Orban, Romania's Head Negotiator to the EU, and Mr. Luca Niculescu, Chief Editor - Delta RFI. 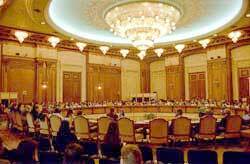 The debates were: United Europe - Romania as a member of EU 27, the European Constitution, the assent of the European Parliament on Romania's accession treaty and the role of the mass media in the European construction. What will reserve the future for Europe? The Ithaka Foundation organized, Tuesday the 9th of November 2004, at the Institute of Political Studies in Paris, a conference having as subject Europes future? 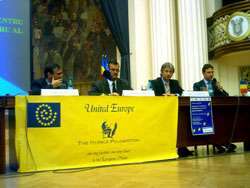 The European Constitution, European Identity and European Citizenship. The debate, enjoying the participation of the Romanian Minister of European Integration, Alexandru Farcas, was the first public event organized by the foundation in Paris. 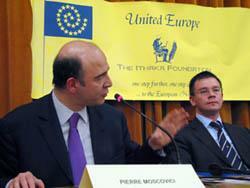 The conference was just one of the events organized under the theme Which Romania in which Europe? European Dynamics in Romania with the support of the Institute of Political Studies- Political Science Paris and enjoying the presence of the French-Romanian friendship group at the National Assembly represented by its president -Jean Pierre Dufau and vice-president -Christian Kert, the Romanian Ambassador in France, Mr. Sabin Pop, the UNESCO Romanian Ambassador, Mr. Andrei Magheru, parliamentary, diplomatic, university and press representatives. Thursday, September 23rd, we took part in one of the series of debates organized by the Ithaka Foundation under its "EU Awareness: one step closer to the European House" Program. The event took place at the Nicolae Titulescu Foundation, under the auspices of ADIRI, a partnership between the British Council and the Ithaka Foundation. (IF) The debate - "Current EU Policy Issues: A UK Perspective", animated by Dr. Philippa Sherrington, Lecturer in EU Politics and Public Policy- focused on the British "awkward" position in the EU, the EMU, general the way the British perceive the EU. 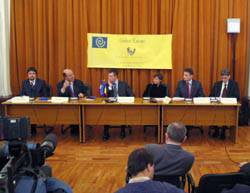 The conference was organized as part of a series of events under the common logo of UK_ROMANIA festival 2004. 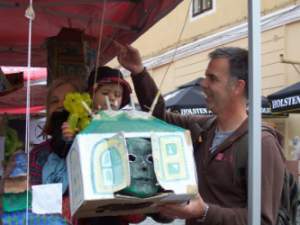 The debate on the EU is the main objective of the IF. A Chapter of the Foundation "New Words for Europe" offers youngsters from Bucharest, Cluj, Brasov and Iasi the opportunity to integrate EU networks, through IF partners: British Council, European Movement, Robert Schuman Foundation, etc. In October, the I F organizes its first European event in Paris, in partnership with The European Movement. The main objective for such initiatives is to "promote a different Romania in Europe", by offering a venue to talented young generations to affirm their selves in the European Concert. Which Romania in which Europe? The Robert-Schuman and the Ithaka foundations in partnership with the French Embassy in Romania organized in Bucharest on March the 12th and the 13th, a conference, "Which Romania in which Europe? Europe as seen by the young Romanians".